Bicycle transport is touted for its many benefits for cities: improving air quality, providing exercise, saving money or reducing traffic. Equally, cycling can help save something that all cities desperately require more of: space. 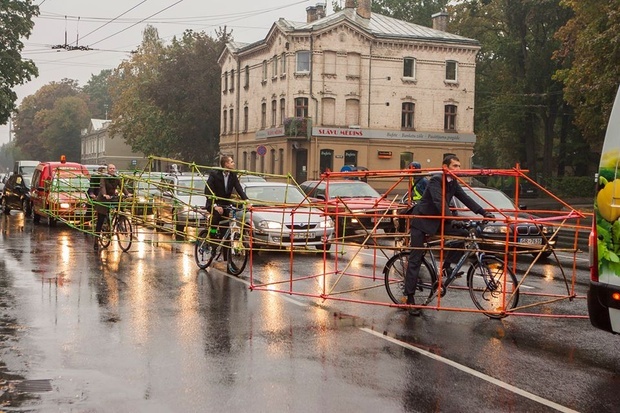 To visibly display how much space vehicles require for driving – in particular during the morning commute – cyclists in the Latvian capital of Riga partook in a rather humorous demonstration for 2014’s International Car Free Day: dressing up as automobiles, dawning car-sized skeletons crafted of bamboo. On a rainy morning in late September, “Let’s Bike It” advocates entered Riga’s crowded streets cycling (or driving?) towards the city centre. They caused quite a commotion and some additional traffic. Still, this rainy cycle ride was well worth it. 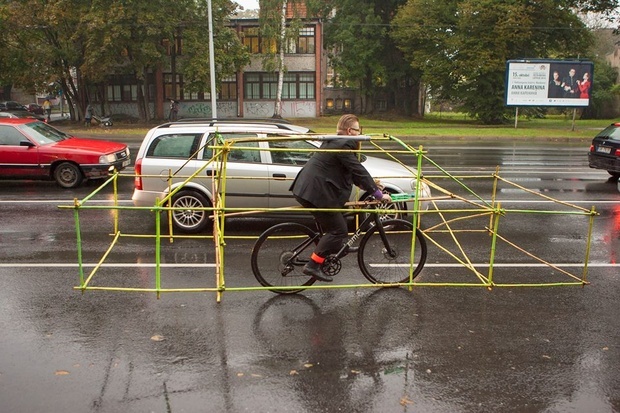 In the process, these car-like cyclists helped (fellow) car drivers recognize the so-called “phantom space” occupied and required by automobiles. 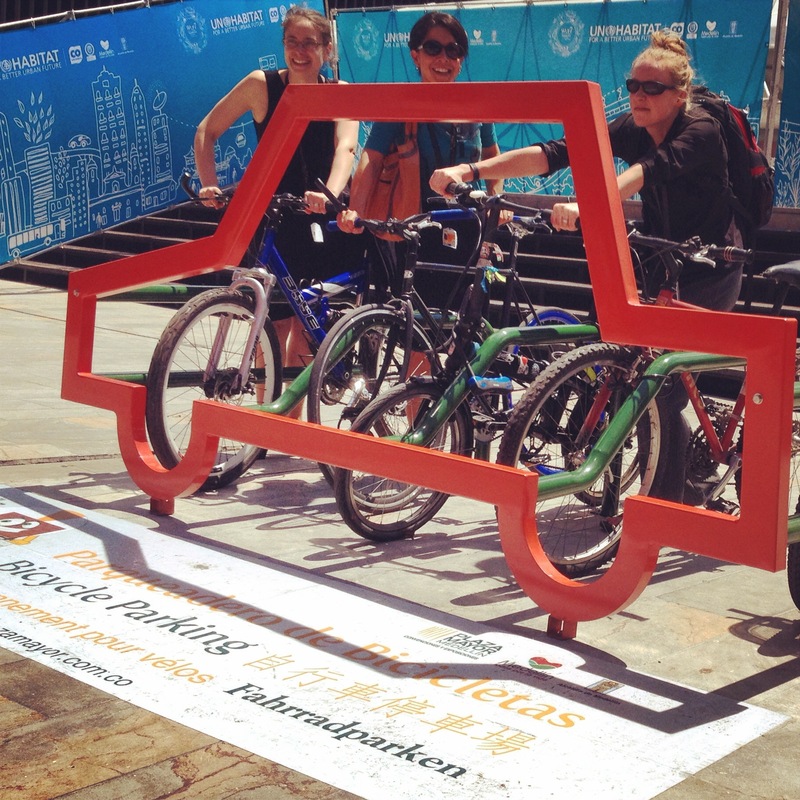 This initiative builds on similar attempts of cities to visibly display the space occupancy of motor vehicles. 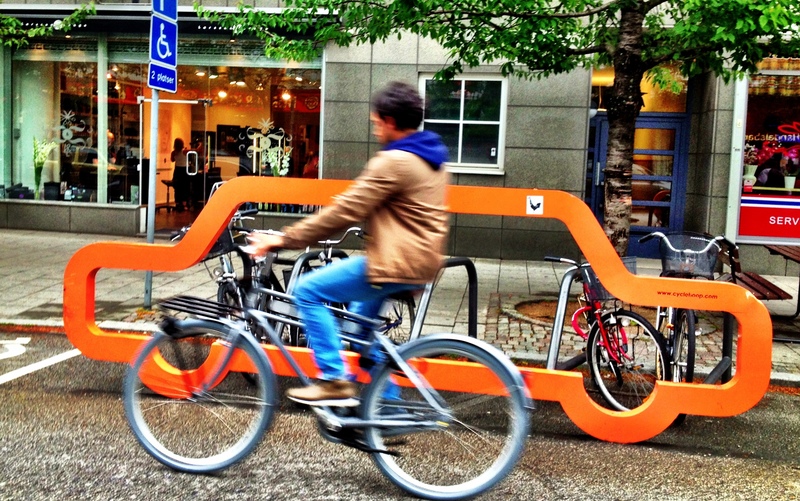 Cities like Malmö and Medellín have attempted to show how much space parked vehicles require, framing bicycle parking slots with images of cut-out cars. The German city of Münster was one of the first to visualize the space occupancy of urban vehicles on the road with their now famous 1991 photo shoot comparing how much space it takes for 200 people on a bus, a light rail, on bikes or in cars. This image has been repeated by numerous cities – my former employer organized a similar photo shoot in Seattle. These various visual references in cities around the globe try to point out the obvious: between parking lots, street parking and the urban road network, cars are a significant urban space occupier. More information on this story can be found on The Atlantic’s Citylab and Vox. All photos: http://vk.com/letsbikeit.